We offer a well presented holiday van at a reasonable price, situated on Shorefield Country Park with fully equipped kitchen, microwave, oven and fridge freezer. Shower room with WC and additional separate WC. 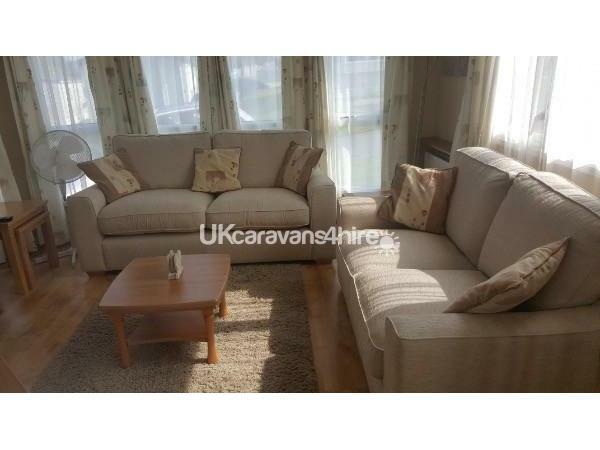 One double bedroom and two twin rooms with option off fold out double bed settee in the living room. All rooms benefit from gas fired central heating and double glazing throughout. A free view 32" TV and DVD player are provided for your entertainment. Some books,games and DVDs are provided for you to use should you wish,during your stay. We kindly ask that these are returned to there respective cupboards at the end of your holiday . with a BBQ/patio area outside where garden seats and table are provided for your comfort,there is an adjoining decking area also,but we must specify that BBQ'S are NOT Held on this area . We ask that you supply your own bed linen and towels, however, duvets and pillows are provided. Situated a ten minutes stroll from the beach and 5 or so minutes from the main leisure and entertainment area. The van is in a prime position. Paulton Park (Peppa Pig world) and Beulieu are just two of the many areas of interest within easy reach of Shorefield Country Park where the van is situated. Fishing, crazy golf, swimming and many more activities are available on site. Please contact Shorefield direct for pricing details. Golf courses are also nearby. Please come and enjoy what the New Forest has to offer. Additional Info: Outdoor pool. Heated Indoor pool . Gym. Spa treatments and nail bar. Children's play areas. Enclosed hard ground football area. Fishing pool.crazy golf, on site shop with good stock,and much more on offer.